In Guelph, we are having an ongoing and somewhat hearted discussion with City Council and the community about the need for a bookmobile. The city mothers and fathers have given the GPL six months of funding to review the service and come up with a new service model. We’ve commissioned a five-member Bookmobile Task Force to study the issue and look for cost-effective options. They are consulting the community, benchmarking other bookmobile services, and developing an action plan that we will take to the City Council in June. Our community is telling us that for Guelph, a university community of 123,000, the bookmobile is an essential community builder. GPL’s bookmobile is used regularly by more than 3,000 folks, including seniors, children, and those from unserved areas south west of Guelph, who are unable to get to us. With 21 stops, it reaches across the city and offers GPL a unique “high touch” opportunity to reach out and connect with: the senior using a walker, the day care student in a snowsuit, and the kids in after-school programs. Interestingly, the seniors have been the most vocal about the possible loss of the service. Many view their connection to the bookmobile and reading as one of the last remnants of a life they knew in their home with kids, a dog to walk, and a garden to tend. They may have given up their home or stopped driving, but they are still reading and cherish their connection to the bookmobile and the freedom it gives them. These are not the eBook readers or database users; these are the large print and Playaway users who spend significant parts of their days with a book or an ear bud! They are determined not to lose the bookmobile service without a fight! The bookmobile is a very emotional issue for Guelph. Many consider it one of the vital services that makes Guelph unique and truly a great place to live. It is clear to me that the bookmobile issue has provided GPL with a golden opportunity to tell and retell the library story. We will redesign the service but I am confident we will continue to serve these folks, who are so dedicated to public library service across the city. Here’s to keeping the GPL bookmobile on the road and serving all of those folks who need us the most. Long may she run! Subscribe to comments with RSS	or TrackBack to 'Why bookmobiles are still in fashion. #9: 2011'. 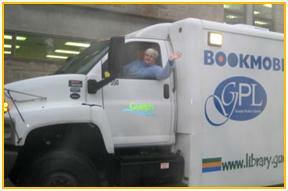 Who is that waving from the Bookmobile? That would be Bookmobile driver Trish.